Versatile AUTOFEED® adjusts for either 5/8” or ¾” cable with a twist of a screwdriver. Recommend 5/8” (16 mm) cable for 3” to 6” (75 to 150 mm) drain lines up to 150’ (48 m). Recommend ¾” (20 mm) cable for 4” to 8” (100 to 200 mm) drain lines up to 200’ (62 m). Powerful, self-contained machine ideal for lateral lines. Easy to transport, minimal set-up – attach a tool and go. AUTOFEED control advances and retrieves cable with a push of a lever, up to 20' (6 m) per minute. Versatile AUTOFEED control adjusts for either 5⁄8" (16 mm) or 3⁄4" (20 mm) cable with a twist of a screwdriver. Cable spins at 200 RPM. Tough, corrosion-resistant cable drum withstands harsh treatment and abuse. It will not dent or corrode and cleans easily. Drum holds 100' (30.5 m) of 3⁄4" (20 mm) or 125' (35 m) of 5⁄8" (16 mm) cable and is designed for quick, easy removal. Balanced design gives the machine a lightweight “feel.” Transport wheels ease loading into service truck/van. Equipped with 550-watt induction motor. K-750 Drum Machine is rated 4.1 out of 5 by 16. Rated 5 out of 5 by Snakeanator from Gets the job done! This is a very powerful machine, it rips though anything. Wouldn’t recommend it for unsupervised first timers. Rated 5 out of 5 by Rhino55 from Great machine I could not depend on plumber to show up, even after many calls to him, to clean our clogged sewer lines. Got fed up with this so I purchased my own machine and love it! Save lots of $ over time and don't have to beg the plumber to do his job! 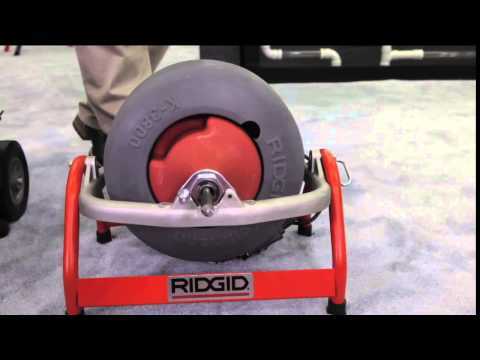 Other macines on market but I wanted the best so I chose Ridgid! Rated 1 out of 5 by Patrickl from I want my money back! Dont buy. I have used this machine about 10 times and it has broken 4 times. Found the warranty process to be average at best. The indirect loss cause to my business is in the thousands. Rated 1 out of 5 by Kieran from Had nothing but problems Had issues with this machine since day one. First it came brand new with a kink in the cable. The soft rubber pad under the frame has fallen broken off. I’ve used the machine on around 5 jobs and when trying to retrieve the cable it snapped off when it wasn’t even caught on a blockage. Had to dig up the drain to remove the cable. Not happy. Never had issues like this with my old sectional. Rated 5 out of 5 by tireiron from This product is well made I had use this machine before where I work ,so went I wanted one for myself I purchase one just like . Rated 5 out of 5 by Lucky1 from Very efficient and usable design and construction. This is a well designed and built piece of equipment. Easy to navigate and to move around. Ridgid has done it again. It is a push in pin to release the cable. Use a very small screw driver and push in to release the pin then slide the cable off.